Chiropractic help is about what DCs do and the conditions they treat. Here you will find comprehensive reviews to help you improve your health. We are dedicated towards assisting you improve your own health. Any professional worth his salt seeks to empower his patients by enabling them to help themselves. Do you have unanswered questions about what to do when you know deep down that your problem is not improving; or, heaven forbid, getting worse? By working with your chiropractor and providing you with information scripted in simple layman's language, this is the place to be. This page was last updated by Dr Barrie Lewis on 31st January, 2019. Are you sick and tired of taking so many pills? Anti inflammatory drugs have a place but cause many deaths every year. What other options do you realistically have? Could we help? Should you be telling your doctor more directly that you really aren't progressing? Will it ruin the relationship if you tell him that you want to consult a chiropractor, or already have? What are the benefits? Are there any dangers? Or should you be consulting an osteopath or a physical therapist? Is a neurologist or orthopedic surgeon the way to go? What if you are getting tingling in arms, hands and feet? Can chiropractic help a joint outside of the spine? What about pubic bone pain? Could we successfully treat your sprained ankle or frozen shoulder? Can we treat hip arthritis? The answer is yes and no; it all depends on how advanced it is. More important is to prevent the various syndromes like dysplasia from progressing to full blown degenerative change. Take this little test; pull your knee to your chest and then to the opposite shoulder. Is it stiff? Are you experiencing pain in the groin? What about tingling in arms and hands? This is by far the most common question raised in our forums. The answer is an unequivocal yes; multiple sclerosis and motor neuron disease excepted. One unusual condition is called meralgia paresthetica. Medicine throws up its hands but it responds well to our care. It causes numbness and sometimes pain and tingling emanating from the groin and spreading down the side of the thigh. Can we help with foot pain? Oh, yes, certainly, but not all chiropractors treat feet. Ask first before making an appointment. Pubic bone pain during and after pregnancy is a not uncommon affliction; could a chiropractor be of help? There are other questions you may be asking; for example, could your popping or clicking jaw be causing the migraines? Our TMJ page describes the close connection between chewing, facial pain and headache. You'll discover at this site that what you do yourself, and that which is not done, will probably have a more profound effect on your well-being than whatever any doctor, medical or chiropractic, can do for you; it's all about taking responsibility for our own body. The long and the short of it is that the modern chiropractor is well equipped to treat many conditions beyond what you may expect. Take vertigo, for example; eighty percent of this horrific syndrome is caused by calcium crystals that have come loose in the inner ear. A simple treatment involving changes of position can remove the offending debris. With falling over and vomiting being common features, it is one of the most awful conditions. Many of my colleagues are now equipped to teach you the Epley manoeuvres as they are called. In my humble opinion every single hip needs to be checked by the chiropractor whether it's painful or not. Like diabetes it is subject to a silent progressive disease that can be detected by the most cursory of examinations. No expensive procedures need to be done; in short, it takes probably less than one minute to evaluate the ranges of motion and perhaps one orthopaedic test like Patrick's Faber. I believe that at least fifty percent of advanced arthritic hips leading to total joint replacement could be prevented if three conditions were ruled out in the young adult. Namely, a short leg, loss of movement due to an impingement syndrome and increased range owing to dysplasia, all of which progressively lead to joint degeneration. These are all great questions that need answers before you jump into chiropractic treatment; here you will find the answers. Chiropractic help is for you when you need more information about the profession. Why chiropractic help tells you something of the reasons behind starting this website more than ten years ago; we used to receive more than 500,000 hits per month prior to the new algorithm; that is an issue we are struggling with. 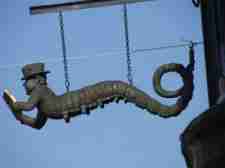 We receive many disturbing letters from around the world; this page is constantly updated. Chiropractic tips is a series of seven emails designed to encourage and enable you discover better well-being; they come every two weeks so there's no threat of information overload. Care of your mind and body in general is very personalised; do you click with your doctor? That's the way the Dutch put it. Like every other profession, fifty percent of all chiropractors graduated in the bottom half of the class, but of course academic achievement is not the only test of a person's competence. Finding a good chiropractor, one who has the skills and knowledge to deal specifically with your problem, is desperately important. How can you possibly make all the right choices? Hippocrates, father of Medicine and Chiropractic too. You can't and, before chiropractic help, understanding your pain and all the possible solutions, may have been fraught with difficulties. Many websites seem to be written with the professional in mind. Here, on the other hand, you will find that I have been crafting my skills since the day I received my first adjustment as a tiny baby. And now my grandchildren are needing treatment, too; yes, they also fall from jungle gyms and tumble down the stairs and need care for their spines. Appropriately done, when there's a need, chiropractic is for everyone. Here you will find your answers, built on long years of experience, written with you, the layperson, in mind. If you don't locate what you are looking for, at the bottom of most pages you can ask for a personalised answer. Please don't write in smartphone language; I won't reply. The trick is to start doing the right things before the nasty symptoms and signs begin to arrive. Usually, ahead of disaster, your body starts to warn you of imminent nightmares. With so many options to confuse you, and very little in the way of understandable and comprehensive information, it's really easy to make the wrong choices, and end up worse off than when you started. It's controversial, and some of my colleagues will hate me, but please think twice before being sucked into care for which you will have to mortgage your house. There are very exceptional cases that require quite a lot of treatment but a year long program for every new patient is patently absurd in my book. The cardinal sign is that your chiropractor spends no more than five minutes with you, and you can see they make few notes of your progress, or specifics of the treatment given on that particular day. The other side of the coin is that you can't expect your chiropractor to fix a sciatica in three treatments; it just won't happen. Serious, and chronic, conditions require a course of care followed by rehabilitation exercises, and possibly an occasional, regular consultation. Abort the recommended program and you may find the problem returning in a month's time. But more than fifty treatments in a year? There are sharks in every ocean, and the chiropractic profession is no exception. In particular, this site is dedicated to enabling you to again take control over your body. Do understand that you will be discouraged from being a passive receiver of care. At Chiropractic Help we think it's important for you to become actively involved in your health; that's the only way will escape from that sense of being a hapless victim of your back. We have no desire for you to make a career of being a patient! Take control over your body again! Our chiropractic conditions page will give you some idea of the scope of our care. For information about the nerve, joint and muscle pain syndromes that we treat on a regular basis, click here; Chiropractic Conditions. For information about common medical conditions that may, there's no research confirming it, also be treatable with Chiropractic help, like heartburn, constipation, arthritis and dyslexia and, yes, even infertility. 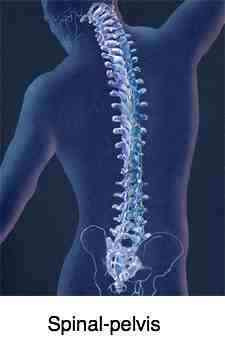 Common medical conditions treated by you chiropractor. Google appears to frown on too many links, so phrases in bold, like that consulting a chiropractor above, and Stones in my Clog below, need to be put into the Site Search function in the navigation bar on your left if you want more information. 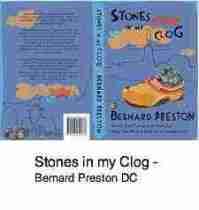 Stones in my Clog, my third Chiropractic book, written in the James Herriot genre, has is now available as an ebook for just $2.99. What have I got myself into? Chapter 1 for you to sample. What have I got myself into? Ch 1 for you to sample. Read Stones in my Clog on your Kindle, Nook, smartphone or tablet. ﻿ It's a light book about the funny, bizarre and sometimes tragic things that happen at the Chiropractic Coalface. Just $2.99. 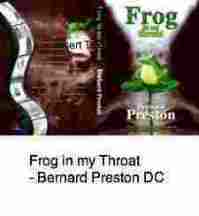 Yes, Dr Bernard Preston and I are one and the same person! I chose a nom de plume to protect the very real identity of the people in these books. 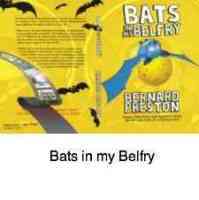 Bernard Preston is still very actively writing books, and this website, but Dr Barrie Lewis is now semi-retired. Better health is about making the right choices; and, yes, some of them are difficult. Anyone who tells you otherwise is a conman. The decision to lose thirty kilograms or stop smoking is a nightmare. 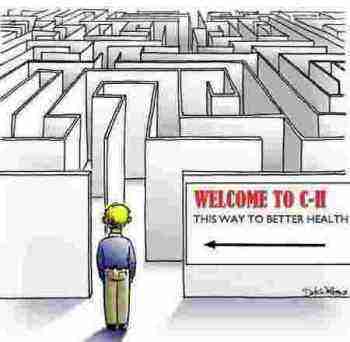 But knowledge is power; this is where you begin your journey; once again, better health is much more than chiropractic help but if we can help you halve your medication then you are already ten steps ahead. Even the resolution to start walking regularly in an effort to grow your bone density and, interestingly, your brain, means giving a determined shake of the head to other items on the agenda. Could you watch three hours less television a week so as not to get Alzheimer's because you were going for a short stroll every day? There is strong research confirming it. Once the decision has been made, both deciding on less television or computer game time and increasing the positive activities can be done; you will be astonished at the improvement in your well-being with just a short walk every day. Right here at Chiropractic Help you will find the inspiration you need. At this site we have helped thousands of people lose a significant amount of weight, quit the weed and start an aerobic exercise program. That's the power of the internet, and you're right here because of chiropractic help. On a personal note, five months ago, for reasons I won't mention as they're private, I decided to give up a forty year old habit of drinking too much beer. I thought it was going to be extremely difficult but I discovered, the resolution once made, that it was not impossible at all. A very surprising benefit along with starting on probiotic called kefir was total relief of very severe heartburn that caused me to sit up in bed until midnight at least twice a week. The victory over these bad habits is won between the ears. This page is a reflection of what goes on in our clinics. Updated every week, these are real cases that will help you grasp what a D.C. does day by day. Actual cases from the Chiropractic Coalface. At the end of another week, it is good to reflect on the sense of awe that our care generates, both in the patient and the doctor. The awesome complexity seen at Grays anatomy and the beauty of the human body, fearfully and wonderfully made, and at the sheer power of Chiropractic help. There are few things that turn me on like talking about Chiropractic help. Here I am, making this year, in the words of Arthur C Clarke, my 64th orbit of the sun, and I am still passionate about going to work. So much so that I plan to go on working until the day I drop. Work? Well, w-o-r-k is a dirty four letter word, right? Wrong! We should love to go to work! I do. "I believe the second half of one's life is meant to be better than the first half. The first half is finding out how you do it. And the second half is enjoying doing it." Chiropractic (from Greek CHIROS and PRACTIKOS meaning "done by hand") is a complementary health care profession. That means we work alongside mainline Medicine, complementing them. Not complimenting them! That's something quite different. We diagnose and treat mechanical disorders of the spine and musculoskeletal system with the intention of affecting the nervous system and improving general well-being; it is based on the premise that back joint dysfunction can and does interfere with the nervous system and result in many different conditions which diminish overall fitness. DC - Doctor of Chiropractic . In most countries DC's are called Doctor. 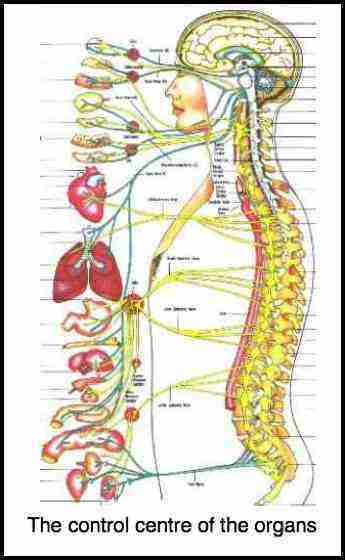 The following chart shows how every organ in the body is supplied by nerves, and the majority of them, though not all, come via the spine. Chiropractic was founded in 1895 by D. D. Palmer, and is now practised by approximately 100 000 men and women in more than 100 countries. Spinal manipulation was however used by the ancients. Both the famed Galen and Hippocrates were really early DCs as well as MDs. Chiropractic Weekly Tips are little things gleaned from over thirty-five years in practice. Not infrequently it's the little things that in end will determine whether chiropractic help will be successful, or whether you'll go for surgery, or simply have to live with chronic pain for the rest of your life. Healthy living tips are for those who want to live to a happy, healthy eighty with all their marbles intact, and taking only a minimum, or no medication; it's far more than chiropractic help. A life without medication is not a pipe dream for the majority of us; but it does take a serious commitment to wholesome living. With obesity killing more people than starvation, hundreds of meal plans abound. Research shows none of them work, but there is some merit in this Banting diet modified. Banting is not so much a diet as a way of grasping what it is that makes us so obese; and in the main it's not fat. With America slipping to 40th in the health stakes world wide, and 10 percent of Europeans expected to be diabetic in just a few years, there has been an enormous shift by the public towards complementary and alternative care. Not just chiropractic help, but robust wholesome living in general, and it's up to the CAM professions to scientifically validate their claims; that's complementary and alternative medicine. There is a link between a high starch coupled with low fat diet and the serious neurological conditions like motor neuron disease. A high omega 6 to 3 ratio causes inflammation in the blood vessels, joints and muscles and presumably other organs; reduce your seed oils, changing to the fruit fats. The olive and avocado are the best examples. The enormous role of foods containing lignans and phytosterols that will reduce cholesterol amongst many other benefits. Combining all the butter versus margarine research in a meta analysis concludes that there is no convincing evidence supporting a change to polyunsaturated oils. Inclusion of chiropractic help in a medical insurance package actually lowers the overall cost. White rice has a very high glycemic index and the sugar is rapidly stored by insulin as fat in the body. Fixated joints are deprived of the oxygen and nutrients required for healthy cartilage and become arthritic. There is a direct link between the number of hours of television watched and Alzheimer's and heart disease. People who exercise regularly have less arthritic pain. Anti inflammatory drugs are the direct cause of at least 14,000 American deaths every year from an intestinal bleed. You'll find much more at our sites; for example how you can make your own hummus or low GI bread in only five minutes. As one esteemed surgeon says, return to the food your grandmother served. The buzz words on future trends are phrases like whole health and natural restoration and slow food made fast. So, it comes as no surprise that our tips page is so popular. The two most important pages at Chiropractic Help are in my opinion are to do with healthy cartilage and bones. At the heart of Chiropractic Help is healthy hyaline cartilage. Go from Chiropractic Help to causes of osteoporosis. Tingling in arms and hands is a busy page at Chiropractic Help. Paresthesias is the medical term and it highlights a disturbed nervous system. Yes, Chiropractic Help is a busy site, with over half a million visits every month, and rising. That tingling could be from the cervical spine, or the inter scalene triangle, in the shoulder, elbow or wrist. First you get warnings that all is not well in the state of Denmark, to quote Shakespeare; ignore them and numbness, pain and weakness soon follow.